Are you watching me baby? 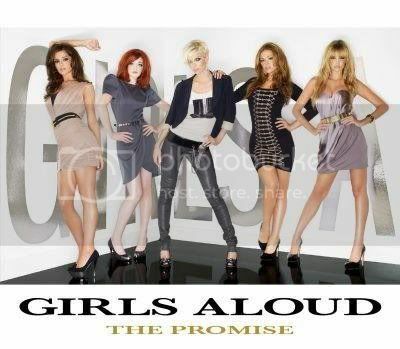 "The Promise" is the nineteenth Girls Aloud single, and their fourth number-one single on the UK Singles Chart. It is the first single to be taken from the band's fifth studio album Out of Control. It was released as a download on 19 October 2008 and on CD on 20 October 2008. "The Promise" won "Best British Single" at the BRIT Awards 2009. It was Girls Aloud's first BRIT award. One day two young Australian musicians of Xenomania, Jason Resch and Kieran Jones, played this '60s sounding backing track to Brian Higgins and "The Promise" was born. Brian and Miranda Cooper didn't write anything to the backing track for a few weeks - they waited until the right time so they didn't ruin this moment. Eventually the right time was a sunny summer Thursday. They wrote the song in seven minutes. The day before "The Promise" was due to be delivered to the label the entire backing track was ditched and replayed from scratch. The minute Girls Aloud heard "The Promise", they decided it should be the first single from Out Of Control. It was decided that the band were now ready to pull off the definitive girlgroup look - that of The Supremes in the 1960s - and that a slightly 60s sounding sound would complement the look. There's three versions of the song available: the normal single version, the album version (which includes a longer intro and different ending) and an alternate version in which Nadine sings Nicola's verse. x The Promise takes the Duffy template for retro '60s pop/soul and given its very own Xenomania twist. Horns blare, harmonies are to the fore, and there's a quite brilliant key change which leads into possibly the catchiest chorus of the year. x Prepare to be surprised by this track, popwatchers, because after the futuristic, cutting edge pop of the last few singles, The Promise is kind of what you'd expect if Nadine and Co had nicked a fluxed-out DeLorean and gone back in time a few decades. Alright, so this seems to be part of a trend by Xenomania to mine the remnants of 60's pop music, as evidenced by the latest Sugababes effort. The jury's still out as to whether we really need this particular kind of revival movement, but doubtless it'll keep your granny and Louis Walsh happy while it all lasts. For me, The Promise was too sharp a change in direction, and too soon. In fact, on the first few listens, the backing track in particular sounded like that bland kind of muzak they used to have in supermarket adverts in the 80's. x With "The Promise" I fear Girls Aloud and Xenomania have made their "War Song". The hook which masquerades as a chorus - the sub-Bacharach "promise I made, promise I made" - is undoubtedly memorable and catchy, but then so was "war, war is stoo-peed, and pee-pool are stoo-peed." And, as with [Culture Club's] "The War Song," the record doesn't seem to know where to go or what to do with itself once the hook has been nailed down; there's a terrible, telling moment near the record's end - directly after Cheryl's "in my arms" - where the song more or less loses itself in a void, all undirected whooshes and pointless spaces, before going into an anti-climactic key change. The effect is as if Xenomania hadn't worked out what was going to go in that space but put the record out anyway, unfinished, and is suggestive of an underlying contempt for their audience. The "song" seems to have been pasted together with BluTak, which makes the opening, hopefully defiant "1! 2! 3! 4!" a clear case of trying too hard to cover up deficiencies. Having a verse structure which changes with every verse does not always represent the pushing of the pop song envelope; here the differences sound contrived, lazy, cynical, messy and unmemorable. And Miranda Cooper's "lyrics" seep an "am I bothered?" shrug from every ill-lit pore. What does "life can live up to love" mean? Or "giving up just looking into windows"? Or the beyond ludicrous "My Aladdin's lamp is down"? And when Cooper doesn't scribble non sequiturs she's busy penning clichés: "I believe in love," "I'm never saying never," "Got a lot to learn 'bout riding through" (riding through WHAT?). Possibly her worst moment here - which is saying much - is "Here I am, walking Primrose" which is not only lazy and contemptuous shorthand lyric composition (as atrocious as anything Gary Kemp ever wrote at his considerable worst) but also, since it clearly refers to Primrose Hill and therefore Plath country, what I'm taking as a personal insult. (...) in general "The Promise" continues the regrettable trend begun on Tangled Up of five voices all singing in unbroken unison, neither Bananarama nor Medeski Martin & Wood; there is no attempt to exploit the harmonic possibilities of five voices, merely a dulled Hollyoaks playground chant long outgrown.